About YOUR Graduate Student Association! As your representative body on campus, the GSA’s mission is to support and speak for the interests of Buffalo State's current and future graduate students. Additionally, we encourage and organize scholarly activities, provide leadership on campus, and promote social opportunities for networking with other like minded people, in professional and academic settings. 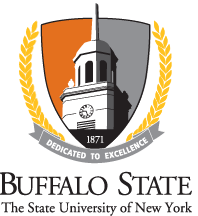 We advocate for your rights and interests while attending SUNY Buffalo State by providing a forum for interaction among our diverse population. We are your representative body on campus. We offer leadership opportunities, services, and programs while furnishing reliable and valuable information. We provide an influential network of current students and alumni for academic and professional development. We promote a sense of community for all students and their families by encouraging and facilitating communication. We partner with various corporations in order to increase awareness of Buffalo State graduates within the professional community. Membership is extended to all full- and part-time matriculated graduate students attending SUNY Buffalo State and pay the GSA fee. Secure funding for their research and scholarship. Create and present professional posters and documents related to research and scholarship.